Some creepy opening scenes set the pace for this excellent Edgar Wallace thriller. A hooded society passes judgement on criminals "beyond the reach of the law" who are summarily hung and dumped into the Thames river. A hangman's rope from Scotland Yard is repeatedly stolen and used in the executions. 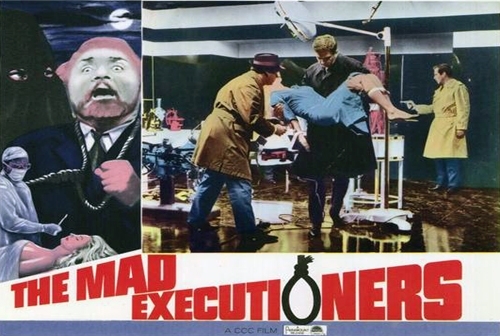 Is a member of Scotland Yard in the society?In the meantime a serial killer is beheading young women and absconding with their heads, which he tries to attach to a robot's body.A step away from being a really superior film, THE MAD EXECUTIONERS is still a minor classic.